In 1792 Henry Walton Smith and his wife Anna opened a small ‘newswalk’ or newspaper round in Little Grosvenor Street, London. Unfortunately Henry died suddenly a few months later leaving Anna to run the business. She went into partnership with Zaccheus Coates until he died in 1812. When Anna died in 1816 the newsagents and stationers business, which was still trading under the name of H W Smith, passed to her two sons, Henry Edward and William Henry Smith who opened a reading room in the strand in 1921. William Henry Smith was the more capable of the two brothers and in 1828 the concern became known as W H Smith. He set up a newspaper distribution network to the major cities based on mail coaches and boasted the company was ‘First with the news’. The “& Son” was added in 1846 when William Henry’s son also called William Henry entered the business on his 21st birthday. WH Smith jr saw potential in the new railway network and on 1 November 1848 the company opened their first railway bookstall at Euston and more railway bookstalls followed. In 1850 they acquired wholesale distribution warehouses in Dublin, Birmingham, Manchester and Liverpool and a substantial rail based newspaper distribution network was established across the country. They rapidly became the UK’s principal newspaper distributor. Their bookstalls became outlets for cheap reprints of out-of-copyright books which were specially produced for railway travellers and were known as “yellowbacks”. The company took a very moral stand on the type of books that they stocked and each volume was carefully vetted, even adverts came under close attention. In 1857 W H Smith Snr. retired and W H Smith II took over the business. In 1860 they started a lending library which lasted until 1961. In the same year the firm acquired its own printing works. In 1864 W H Smith Jnr. wanted to devote more time to politics and took in a business partner William Lethbridge. By 1868 Smith Jnr. was the Liberal-conservative MP for Westminster, and in 1874 he retired from active partnership in the business. 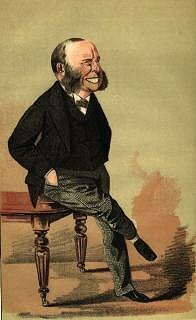 He held posts of Financial Secretary to the Treasury (1874-77), First Lord of the Admiralty (1877-80) (The Gilbert & Sullivan song with the famous line “now I am the Ruler of the Queen’s Nav-ee” from HMS Pinafore was aimed at his appointment) and Secretary for War (1885). He led the House of Commons under Salisbury till his death in 1891. His widow was created Viscountess Hambleden and his eldest son, who became the second Viscount Hambleden in 1913, became the head of the business. A Superannuation Fund for clerical workers was founded in 1894 with a Pension Fund for manual workers the following year. The first overseas branch opened in Paris in 1903. In 1905 the company faced huge rent rises the bookstalls on the Great Western and the London and North Western Railway Stations so the firm moved off the concourse, set up a Shopfitting (Estate) Department and opened 150 new shops all within the year. Their own Publicity Department was started in 1911. World War I saw more than 4,000 WHSmith people serving their country. The new Head Office, Strand House in Portugal Street, was used as the Postal Censor’s office in 1918. Post war expansion included opening a bookshop in Brussels (1920) and the acquisition of the Truslove & Hanson London bookshops (1923). Second Viscount Hambleden died in 1928 and was succeeded as head of the business by his son, the third Viscount. The death duties payable necessitated the formation in 1929 of WHSmith & Son Limited, a private limited liability company. 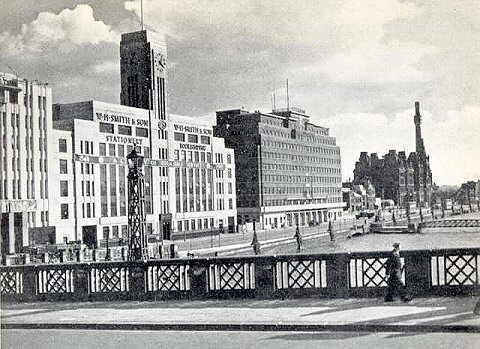 In 1933 the purpose-built Bridge House, Albert Embankment (shown left) opened to house the Bookbinding Works and Stationery Department.During World War II over 5,000 men and women from the company went into the forces and in 1941 the first travelling bookstall appeared to replace bombed-out bookstalls. Post war expansion started in 1946 when the business acquired the Sherratt & Hughes chain of bookshops. Heavy death duties following the death of the third Viscount Hambleden in 1948 resulted in the formation of a public holding company WHSmith & Son (Holdings) Limited on 1 September 1949. The first Governing Director, and later first Chairman, was the Hon. David Smith, brother of the third Viscount Hambleden. WHSmith expanded into Canada in 1950, and in 1953 acquired the Bowes & Bowes bookshops. In 1956 the Book Department moved to Bridge House, Lambeth from Strand House, Portugal Street. The biggest book club operation in Britain, Book Club Associates, was founded in 1966 in a joint venture with the American publishing firm, Doubleday. 1967 saw the centre of book and stationery distribution moved to Swindon from Bridge House, Lambeth. In 1972 CHW Troughton became Chairman, the first head of business from outside the Smith family. Over the last few decades the business expanded into Record Shops, Travel Agencies, DIY centres, Television Services, and the US when the company took over the 300 stores belonging to Elson’s Holding Inc. Some of these ventures have been sold off but the WHSmith Group is one of the UK’s leading retail, publishing and distribution companies with 1,464 stores world-wide, employing over 30,000 people in 12 countries and turnover of some £2.9bn.